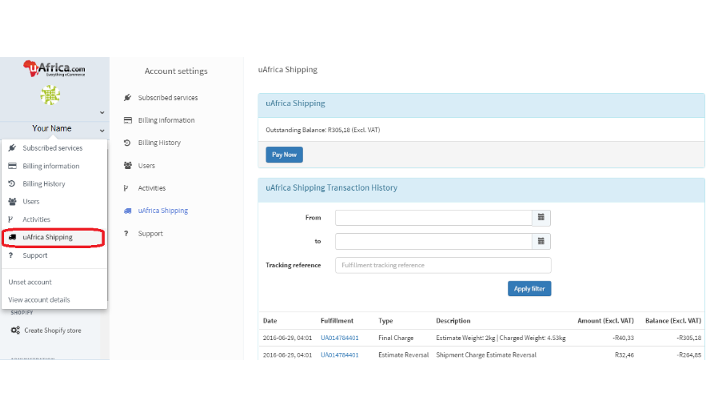 Sellers, please first read our Help article on How to Activate uAfrica Shipping. Step 1: Get quotes and fulfil an order. 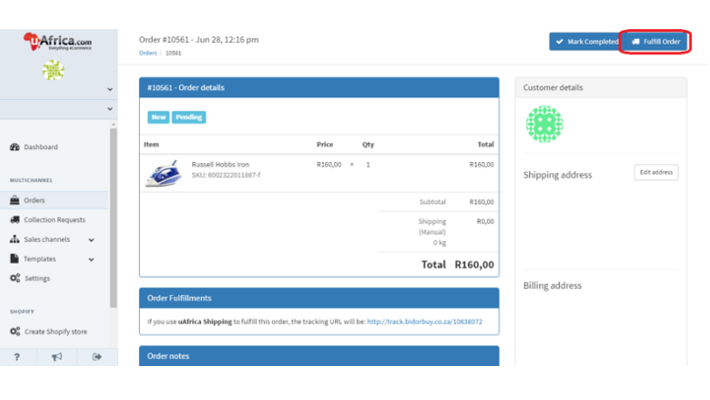 Click on the order number to see the order’s detail page and then select “Fulfill Order” in the top right of the screen. Select "uAfrica Shipping" as the Fulfillment Provider and adjust the dimensions and weight for the parcel. Make sure to use the correct parcel dimensions otherwise the estimates you receive will be very different to the final value charged. Select "Get new quotes". You will see the quote estimates at the bottom of the screen. Please note that the quotes you see will only be estimates at this stage. Select the courier and service level corresponding to the quote you're happy with. 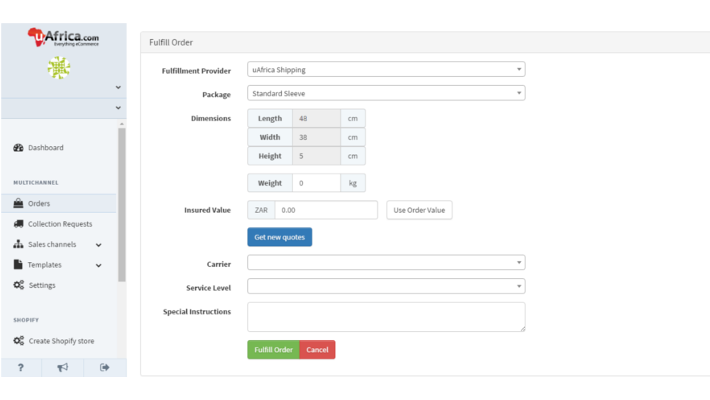 Click on "Fulfill Order". Step 2: Print your waybills. An A4 waybill will automatically be generated and downloaded as a pdf document which can be printed immediately. Affix this waybill to your parcel. Click on “Request Collection” at the top of the page. A drop down will appear with the various carriers. 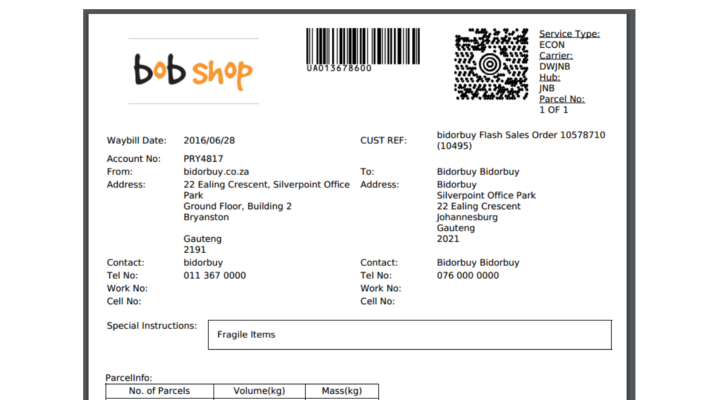 The carrier you select will automatically be notified to collect the item from your sender address. Step 4: Make payment after delivery. Click the drop down menu in the top left corner of the screen, where you see your name. Whom to contact for help when using uAfrica Shipping? Please email support@uafrica.com or phone 021 940 1060 if you need help when using uAfrica Shipping. You will be charged on either volumetric weight or actual weight, whichever is higher. You can request stationery (flyer bag, stickers and document sleeves) by contacting the couriers directly and quoting the account number that appears at the top of your waybill. Couriers tend to do deliveries in the morning and collections in the afternoon, so if you submit your collection request before lunch time (usually 13h00) for collection in a major centre, the courier will collect the same day. Standing arrangements can also be made with the couriers. If you need to print your waybills again, you can access them via the order details page. Multiple fulfillments for the same day only require one collection request per courier i.e. 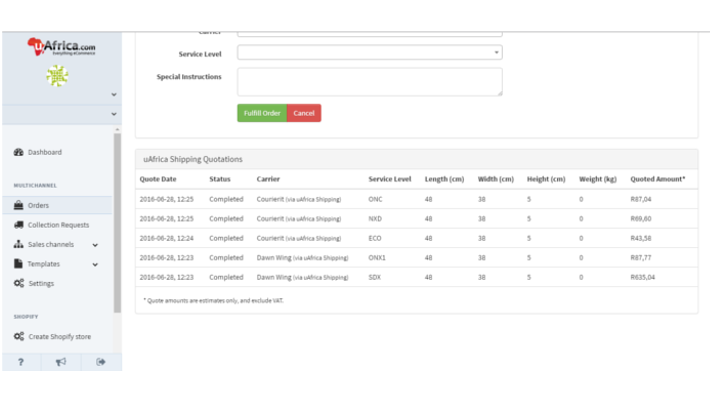 you can fulfill a number of orders and, when you are ready, make a single collection request for all those fulfillments. Please note that when an order is fulfilled, you are charged an estimate based on the information you provided with the quote. Once the shipment is completed the initial estimated cost is reversed and the actual cost of the shipment is applied to your uAfrica account. The courier may also add additional surcharges e.g. if a shipment is made to an embassy or farm. You will be billed for uAfrica Shipping in arrears. There is a credit limit set on your account requiring payment either once this limit has been reached or with the monthly billing cycle at the beginning of each month (whichever comes first). All payments will be billed in South African Rands and exclude VAT.